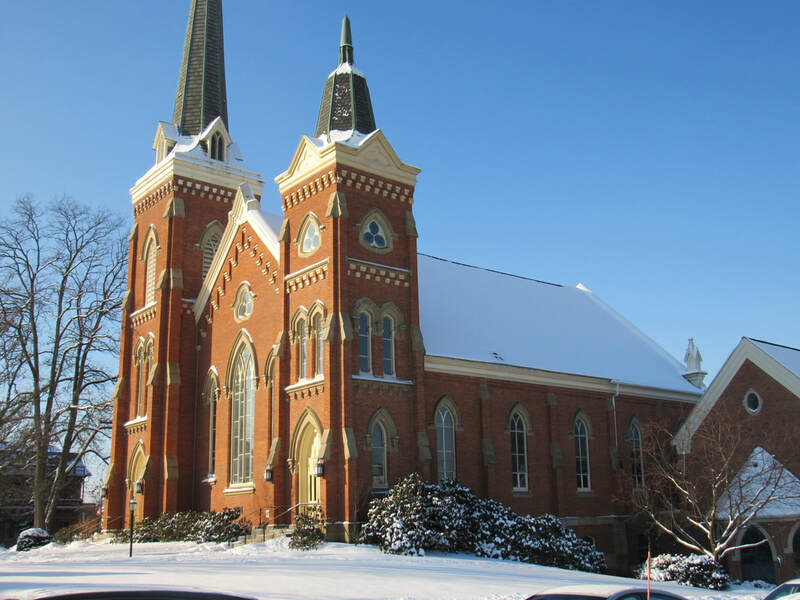 ​The congregation of the First Presbyterian Church of Meadville, founded in 1800, gathers in what is actually the second building on this site. The first was constructed in 1818 and demolished in 1873. 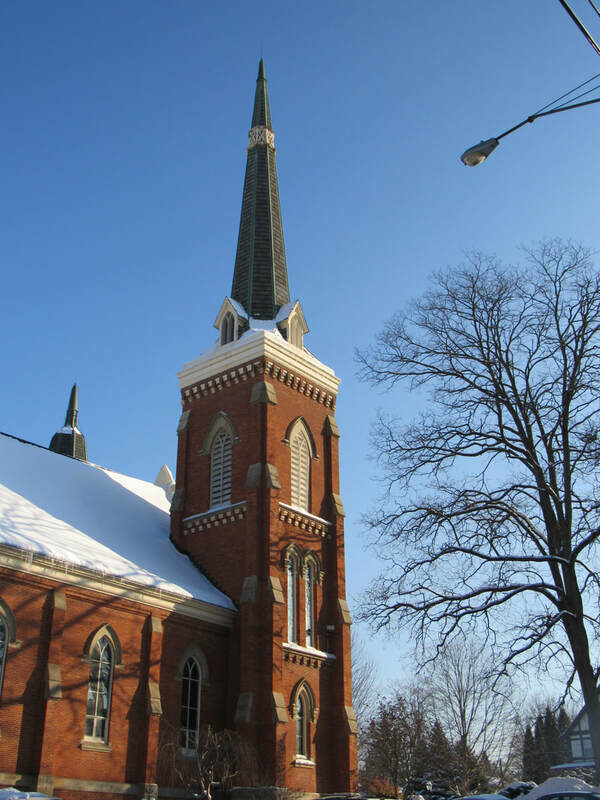 The present church was completed in 1875 at a cost of $43,000 (roughly $950,000 in today's currency). It is a fine specimen of the Victorian Gothic style, of brown brick and sandstone trim, with a length of 112 feet and a width of 75 feet. ​Looking southwest on a glorious winter morning. The south tower, rising to a height of 150 feet, is a local landmark. South tower, detail. Behind the grille is a 1,000-pound bell cast at the Meneely Bell Foundry in Troy, New York. This bell has called the faithful to worship every Sunday since 1875. In 1932, the original clear windows were replaced with ones crafted by the Pittsburgh Stained Glass Company. 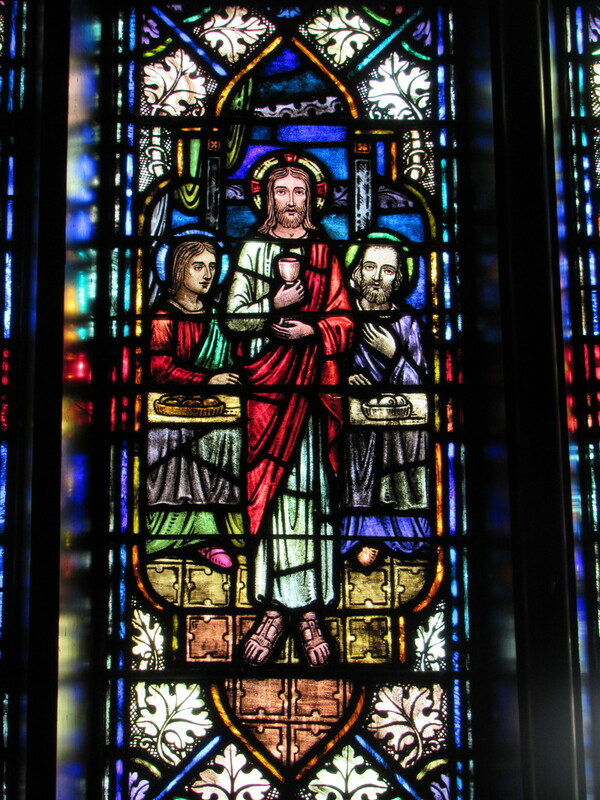 Ten windows, including this one, adorn the north and south walls of the sanctuary. ​The east window, 22 feet high and six feet wide. Text at bottom reads "Greater love hath no man than this: that a man lay down his life for his friends -- John 15:13"
Some of the east window, detail. 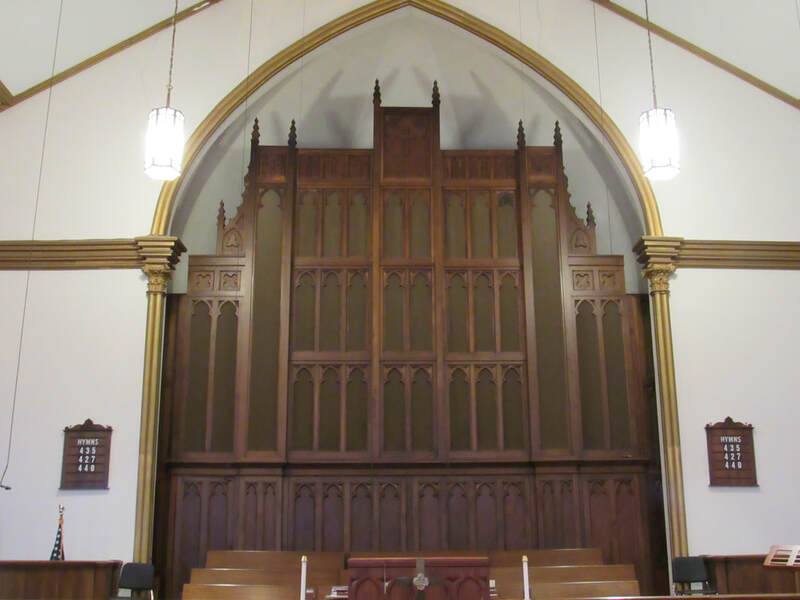 This organ screen, designed by the architects Hanna & Stewart of Meadville, was installed in 1948 as a memorial to the church members who lost their lives in the Second World War. Behind the screen lurk the 2,500 pipes of the Schlicker organ. 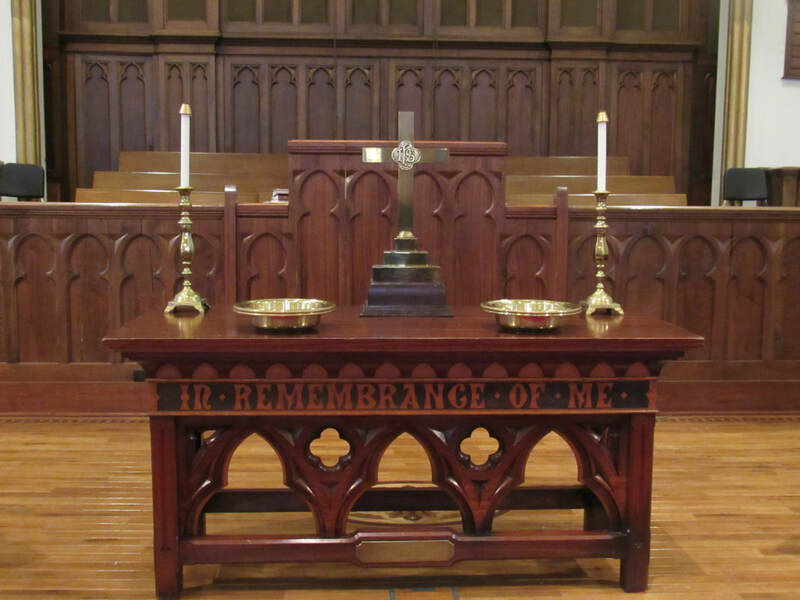 ​and of his love of the Church in which he was Ruling Elder, 1830-1884"
"In memory of our Mother, Mrs. Harriott Derickson, 1800-1879"
The sanctuary is connected to the Christian Education building, constructed in 1971. It contains classrooms, a gymnasium, and a daycare, as well as the church office. ​The newest addition to the church campus, built in 2000 to celebrate the 200th anniversary of the church's founding. 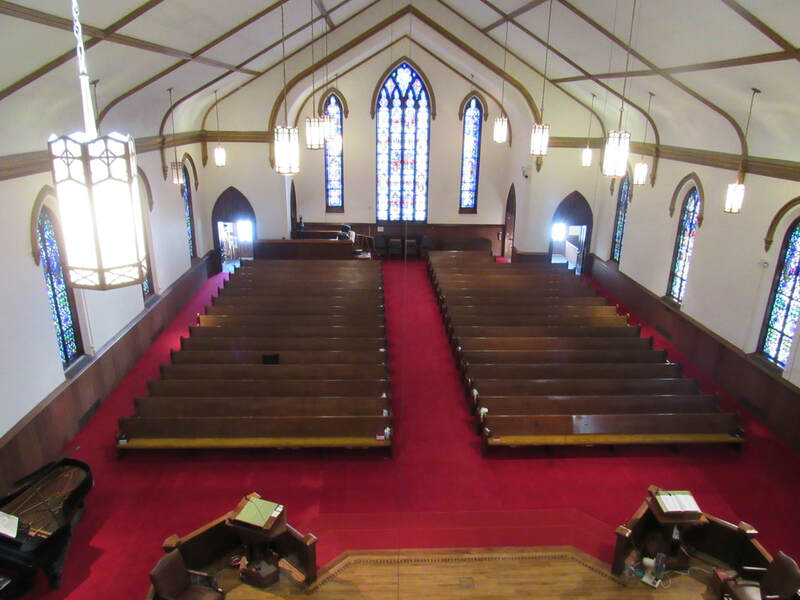 On the lower level is a 75-seat chapel, and the upper level contains the choir room and music director's office. Note the details, such as the pointed-arch windows and lighter trim, which bring this addition into harmony with the original building.